Star Wars Adventures: Tales from Vader’s Castle #4 is the latest issue in IDW’s all-ages Halloween anthology series, this time featuring a band of Ewoks who must protect their tribe from a monster that stalks the woods. 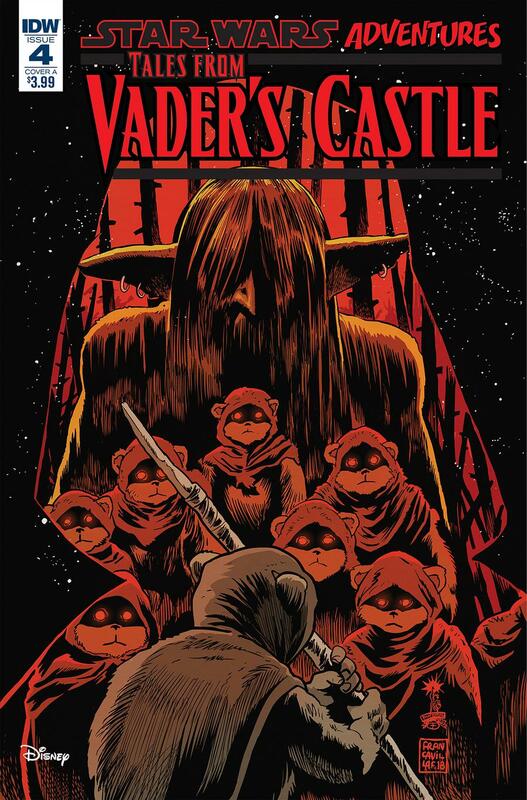 This week in Tales from Vader’s Castle #4, the tale of which our heroes are suddenly reminded is one involving Ewoks and mind-control, and monsters. All the issues have leaned unabashedly on tropes, hoping to deliver fun, simple “Halloween, but Star Wars” stories for a younger audience, but this one seems to feel the most uninspired and obligatory. It’s jam-packed with boring expository dialogue (actual wildlife names from this comic: boar-wolf and condor-dragon) and I can’t say for certain whether or not this is to represent that the dialogue is translated from Ewokese, but either way it makes for pretty pitiful and unimaginative children’s reading. The art is as dull as the story and actively clashes with the framing story’s art and coloring which has been done by Derek Charm since Issue #1. The opening and closing panels are vibrant and cartoonish, befitting the theme, but the Ewok portion is rough and sketched, save for a few photorealistic close-ups of Ewok faces. It ends up looking antique or vintage - and at odds with Charm’s art - mostly because of the terrible coloring choices by Charlie Kirchoff; he’s created something like a grisly version of Winnie the Pooh (and that works about as well as it sounds). Tales from Vader’s Castle #4 must have been the short straw of the story ideas and neither the writer nor the artists are on their game for this issue. As a young Star Wars fan’s read with a Halloween twist, it’s boring. As a monster story or a new delve into the forest moon of Endor, it offers no explanation for the cause of its events nor any Star Wars detail worth knowing. So far, Tales from Vader’s Castle has been defined by its hit-and-miss nature and followed every good issue with a bad one. The best thing I can say for this issue is that it put its tally in the “miss” column and hopefully cleared the way for the final issue to finish that pattern strongly.